The Texas Tribune and ProPublica uncovered a scandal at the Rio Grande border separating Texas from Mexico, which made one man very rich and almost everyone else quite unhappy. The scandal all started with good intentions: protect the border. in 2007 Congress tasked the Department of Homeland Security with building 60 miles of fence along the Rio Grande Valley. The Rio Grande river separates Texas from Mexico and in some places is passable by wading. It’s an easy access point for criminals crossing the border. One local official, Godfrey Garza Jr., saw an opportunity he couldn’t miss. Garza had already planned to repair 22 miles of levees in this area through his already established obscure agency. Why not have Homeland Security kill two birds with one stone? It could finance fixing the levees and build the fence– and he could profit from it. Sounds simple? Right. Apparently, it was. Over the next several years, the federal government poured more than $174 million into the bank accounts of the Hidalgo County Drainage District No. 1 to build a fortified levee. The result was unique among the 654 miles of fence constructed by the agency across the U.S.-Mexico border: a looming, 15-foot-high vertical wall of concrete, topped in places by another 18 feet of rusty metal fence. And the payouts kept coming. The draining company subcontracted out the work to a company owned by Garza’s children, and his family pocketed another $1 million. In 2008 a local whistleblower, Lora Briones, reported concerns and the district’s chief financial officer went to the FBI. It took another six years for the county to launch its own investigation in 2014. 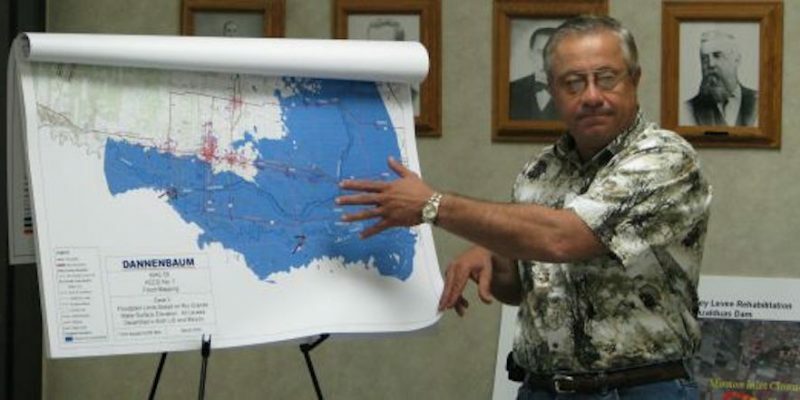 In the meantime, Garza resigned from his position in 2010 and on the very same day, the drainage district board gave an exclusive contract to a company called, Integ Inc., to take over Garza’s duties. Guess who Integ’s president and sole owner was? Garza. It also came out in court that the drainage district board destroyed 140 boxes of records related to the project. Then the county sued Garza “for breach of contract and conspiracy to commit fraud.” (The money allegedly went to Garza’s family, apparently.) Next, Garza counter-sued the county, alleging it owes him more than $1 million in back pay. This February the county’s lawsuit is scheduled to go to trial. To date, the Hidalgo County drainage system is in need of repairs to the tune of tens of millions of dollars.